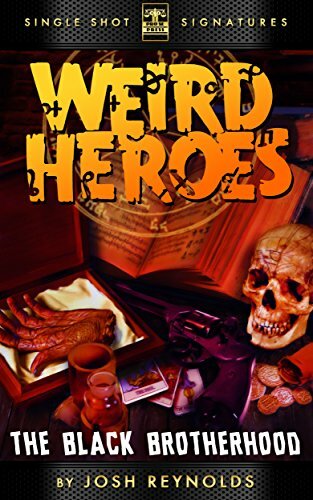 FOR IMMEDIATE RELEASE JOSH REYNOLDS’ FINAL ‘WEIRD HEROES’ DEBUTS FOR 99 CENTS! eaturing a new strange protagonist from one story to the next, Joshua Reynolds’ WEIRD HEROES held a unique place amongst the Pro Se Single Shot Signature Series. Now, this fantastic series concludes with a tale of horror and dashing daring do featuring one of Reynold’s most popular characters! Featuring an intriguing cover and logo design by Jeffrey Hayes, and formatting by Marzia Marina, WEIRD HEROES: THE BLACK BROTHERHOOD is available now for only 99 cents at Amazon at https://www.amazon.com/Weird-Heroes-Brotherho…/…/ref=sr_1_1…and for most digital formats via Smashwords at at https://www.smashwords.com/books/view/699722.